The British and Irish checklist of Cynipoidea is revised, considerably updating the last complete checklist published in 1978. Disregarding uncertain identifications, 220 species are now known from Britain and Ireland, comprising 91 Cynipidae (including two established non-natives), 127 Figitidae and two Ibaliidae. One replacement name is proposed, Kleidotoma thomsoni Forshage, for the secondary homonym Kleidotoma tetratoma Thomson, 1861 (nec K. tetratoma (Hartig, 1841)). This paper continues the series of updated British and Irish Hymenoptera checklists that started with Broad and Livermore (2014a), Broad and Livermore (2014b), Liston et al. (2014) and with an introduction by Broad (2014) . This represents the first complete update of the British list since 1978 ( Fitton et al. 1978 ). The Cynipoidea is a rather diverse superfamily of three British families (the Austrocynipidae and Liopteridae are entirely extralimital). 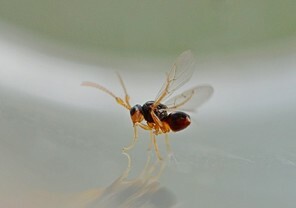 The Figitidae and Ibaliidae comprise koinobiont endoparasitoids of other insects whereas the Cynipidae are gall-formers, or inquilines of gall-formers. A summary of cynipoid biology can be found in Gauld and Bolton (1988) . 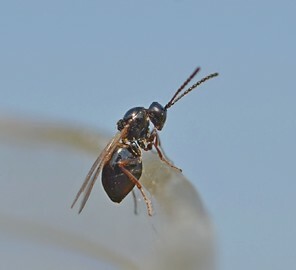 Briefly, many Figitidae are parasitoids of Diptera larvae although the Charipinae are hyperparasitoids of primary parasitoids in aphids and some other Homoptera and the Anacharitinae are parasitoids of Hemerobiidae (Neuroptera); the small family Ibaliidae are specialised parasitoids of Siricidae larvae; and the Cynipidae are entirely phytophagous, most conspicuously as gall-formers of oaks (Quercus) but with numerous species galling other Rosaceae (and a few other plants) and the tribe Synergini are inquilines of other cynipid galls. A few representative Cynipoidea are illustrated in Figs 1, 2, 3 .
a: Male Synergus sp. (J. Bowdrey). 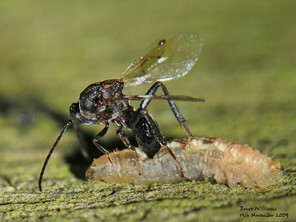 b: Ovipositing female Neuroterus anthracinus (Curtis) (J. Bowdrey). The British Cynipidae checklist was updated comparatively recently ( Spooner and Bowdrey 2000 ) and Irish checklists were published by O'Connor and Nash (1998), O'Connor et al. (2003), O'Connor (2004), O'Connor et al. (2009) and O'Connor et al. (2009) . Our knowledge of the figitid fauna is still far from perfect but recent work by M. Forshage on the European Eucoilinae and a catalogue of Charipinae ( Ferrer-Suay et al. 2012b plus updated synonymy in several other papers) have been timely. MF has sorted and identified the BMNH collections of British Eucoilinae, adding many new species and distribution records. 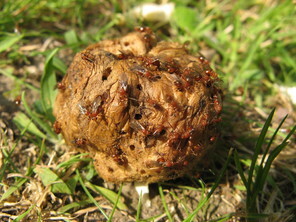 In contrast to the rather neglected Figitidae and Ibaliidae, gall wasps (Cynipidae) have received a certain amount of attention over the years and are studied and recorded under the auspices of the British Plant Gall Society. The numbers of valid, certainly identified Cynipoidea are listed by family and country in Table 1 . The total fauna has increased by 9% since the last checklist ( Quinlan 1978b ). This rather small increase can be explained by the substantial increase in taxonomic work in recent years, resulting in synonymy and corrected identifications nearly keeping pace with new discoveries. Numbers of conﬁrmed British and Irish Cynipoidea broken down by family and country, with numbers from the 1978 checklist ( Quinlan 1978b ) for comparison. Totals do not include uncertain identiﬁcations. We reference all additions to and deletions from the 1978 British list ( Quinlan 1978a ) and record country-level distribution within the British Isles, i.e. England, Scotland, Wales, Ireland (as one unit) and the Isle of Man. A more complete introduction to the methods and rationale behind this checklist series can be found in Broad (2014) . Distribution data for Cynipidae are mainly derived by JPB from published sources, but thanks are due to the following for supplying additional data: Janet Boyd, Records Data Manager, British Plant Gall Society; Adrian Fowles, Countryside Council for Wales; Kate Hawkins, Manx Natural Heritage; David Notton, BMNH; Mark Pavett, National Museum of Wales (all pers. comm.). Distribution data for Figitidae and Ibaliidae are mainly from BMNH and cited published sources. Word document and Excel spreadsheet versions of the checklist are available as supplementary files: Suppl. materials 1, 2 . Liljeblad and Ronquist (1998), Ronquist (1999) and Ronquist et al. (2015) employed a series of monophyletic tribes, in the absence of strong evidence for relationships above this level. Synonymy for Cynipidae includes all names that have appeared in the British literature but does not necessarily include all Palaearctic names proposed as varieties or forms. For complete synonymy please see Melika (2006a) and Melika (2006b) , also Nieves-Aldrey (2001) . It should be borne in mind that future molecular studies may change our understanding of some species concepts and their alternating generations. The availability of the name Aulacideini has been questioned and is currently being looked into. This will possibly only be solved by the ICZN. [andrei (Kieffer, 1900, Aulax)] Added by Bagnall (1931) from the gall. Discussed by Bowdrey (1999) , who concluded that this record was in error. added by Bowdrey (1994) . A. pigeoti, added by Bagnall and Harrison (1930) on the basis of galls only (root collar of Tragopogon porrifolius), was synonymised by Eady and Quinlan (1963) with tragopogonis but erroneously so with hieracii in Fauna Europaea ( Noyes et al. 2004 ) (Nieves-Aldrey, pers. comm.). rogenhoferi: galls bracts of Centaurea scabiosa, but not now considered to be a distinct species ( Nieves-Aldrey 1994 ). Added by Jennings Jennings (2016) . Generic classification of oak-associated Cynipini follows Melika and Abrahamson (2002) . As sexual and agamic generations have often been described under different names, those based on agamic generation are denoted by the suffix '-a-', those based on the sexual generation by '-s-'. [clementinus (Giraud, 1859, Cynips) -a-] Added by Cameron (1893) from the gall only. 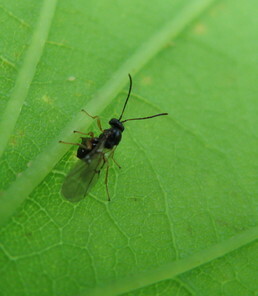 An agamic female in the Morley collection at Ipswich Museum is quercusradicis. No recent records. [gallaetinctoriae (Olivier, 1791, Diplolepis) -a-, syn. tinctoria (Hartig, 1843, Cynips) -a-] Niblett et al. (1932) (following Houard) state that this species was accidentally introduced in the 19th Century on Quercus aegilops, and never established. [gallaeurniformis (Boyer de Fonscolombe, 1832, Diplolepis) -a-, syn. sufflator Mayr, 1882 -s-] First recorded from old galls by Bagnall and Harrison (1918) . Sexual generation also included by Eady and Quinlan (1963) , doubtfully British, no confirmed records. [quercustozae (Bosc, 1792, Cynips) -a-] Added by Eady and Quinlan (1967) on the basis of a single gall found on a road at Kew. No further records. [trotteri Kieffer, 1898 -a-] Added by Bagnall and Harrison (1918) from the gall only. No further records and rejected as British by Eady and Quinlan (1963) . Sexual generation catkin galls first recorded by Traill (1873) . The asexual generation, described as giraudianus Dalla Torre & Kieffer, 1910, has not been recorded in Britain. Added by Leach (1999) . First recorded from the agamic generation, the sexual generation was reported by Walker (2001b) . 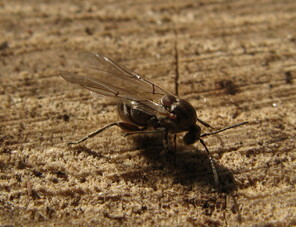 Cynips ambigua was placed by Bellido et al. (2005) in synonymy with corruptrix but previously regarded as a distinct species ( Melika et al. 2000 ). Agamic generation reported by Harrison (1930) from Co. Durham and Forfarshire. The sexual generation was described as forma elianae. Form larshemi Leeuwen and Dekhuijzen-Maasland (1958) , was described as the sexual generation of corruptrix but is now believed to be improprius Bellido & Pujade-Villar, 2004, fide Folliot et al. (2004) , who also produced the true sexual generation of corruptrix experimentally. Added by Bowdrey (2015) ; an adult female was identified as this species by G. Melika with the proviso that it might be the sexual generation of a morphologically undescribed species known from DNA sequencing. Added by Bowdrey (2009) . Previously reported by Ormerod (see Cameron 1893 ), but reportedly as a leaf gall, so the record is suspect. Gall recorded by Bagnall and Harrison (1919) and adult male possibly of this species by Eady and Quinlan (1963) . Only the sexual generation is known, inducing bud galls of Quercus robur, collected in France ( Dalla Torre and Kieffer 1910 ). Bagnall and Harrison (1918) mentioned this species from Great Britain but this record requires confirmation ( Eady and Quinlan 1963 ). A species of uncertain status, type probably lost. Added by Walker (2001a) . Rearing experiments by Walker (2002) confirmed grossulariae to represent the sexual generation of a lifecycle also involving the asexual generation galls known as mayri/ panteli, a pairing also indicated by DNA sequence data ( Stone et al. 2008 ). Nineteenth Century introduction ( Adler and Stratton 1894 ; Niblett et al. 1932 ). Added by Mosley (1892) from Yorkshire and by ( Cameron 1893 ) from Loch Lomond (sexual form). Not recorded subsequently until reinstated as a British species, from London specimens, by Stone and Sunnocks (1992) . Nomenclature follows Pujade-Villar and Melika (2000) . Taxonomy follows Melika et al. (2000) . Synonymy of marginalis and quadrilineatus established by Folliot (1964) . Gall recorded by Bagnall and Harrison (1918) and Burkill (1933) . Modern UK status uncertain. Galls of the sexual generation unconfirmed in Britain. See also under testaceipes. sieboldi f. poissoni Folliot, 1964: sexual generation, produced experimentally. Maintained with a query; possibly the unconfirmed sexual generation of rhyzomae (q.v.). If specifically distinct, British records need confirmation. See Melika (2006a) . [glandium (Giraud, 1859, Andricus) -a-] Recorded by Rolfe (1881) and Askew (1959) but in error fide Eady and Quinlan (1963) . Callirhytis hartigi Förster, 1869 established as the sexual generation by Pujade-Villar et al. (2007) , who produce evidence that erythrosoma may be a separate species. [quercus (Fourcroy, 1785, Diplolepis) -a-; syn. pubescentis (Mayr, 1881, Dryophanta) -s-] Both generations reported by Bagnall and Harrison (1918), Bagnall and Harrison (1919) from several localities in Northumberland and Tyne & Wear, perhaps in error due to confusion with the similar quercusfolii. There are no subsequent records and the species requires confirmation as British. Galls of the sexual generation were recorded as flosculi by Bagnall and Harrison (1918) ; there appear to be no further records. [cerriphilus Giraud, 1859 -a-] Galls recorded once by Fitch (1874) ; no further UK records. Added by Malumphy (2015), EPPO (2015) . This highly invasive, East Asian species has spread across Europe and has recently been reported from Kent and Hertfordshire. 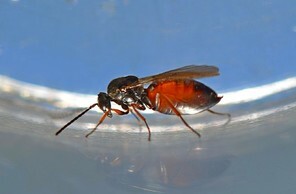 As the UK has Protected Zone Status for this global pest, apparently successful attempts were made to eradicate D. kuriphilus at the two outbreak sites and it should not be formally added to the British list at this stage. [punctatus (Bignell, 1892, Spathegaster)] Described by Bignell (1892) , no subsequent records. Form ‘borealis’ described by Entwistle and Hails (1997) . flavipes (Boyer de Fonscolombe, 1832, Diplolepis) -a- nom. ob. Transferred from Andricus by Pujade-Villar et al. (1998) . Added by Robbins (2007) based on old agamic gall only; subsequently found at Imperial Wharf and Royal Botanic Gardens, Kew, both London (D.G. Notton, pers. comm.). Galls introduced Quercus ilex and Q. coccifera. Added by Robbins (2007) , based on old agamic gall only. Added by Hancy and Hancy (2004) . Added from sexual generation gall, adults reared. Recent records from Devon, Cornwall and Hampshire (Isle of Wight). Catkin galls reported by Biggs (2011) from Isle of Wight as forma fusifex, which has no taxonomic status. [synaspis (Hartig, 1841, Apophyllus) -a-; syn. megapteropsis Wriese, 1900 -s-] Recorded by Bagnall and Harrison (1918) from the agamic gall; no further records. [mayri Reinhard, 1876] The status of mayri as a British species appears to rest solely on three published references to the species: Cameron (1893) , subsequently quoted in Connold (1909) and repeated by Swanton (1912) . Nowhere does Cameron claim to have evidence of this species’ occurrence in Britain, merely comparing its gall to other British species of Diastrophus and Xestophanes. As there appear to be no genuine UK records it should therefore be excluded. Close to caninae, taxonomic status needs revision (note in Fauna Europaea). brevicornis (Curtis, 1838, Cynips) preocc. Galls recorded from Co. Durham ( Bagnall 1917 ), Derbyshire ( Fordham 1917 ), Northumberland ( Bagnall 1917 ) and Scotland ( Bagnall 1932 ). No recent records. Synonymised with Phanacis ( Eady and Quinlan 1963 ); re-established by Nieves-Aldrey (1994) but Melika (2006a) again treated Timaspis as a synonym of Phanacis. [sonchi (De Stefani, 1900, Aulax)] Galls recorded from Norfolk and Surrey by Bagnall and Burkill (1935) but no recent records. Possibly confused in the literature with Aulacidea follioti which also galls Sonchus asper ( Nieves-Aldrey 2001 ). Galls recorded in Norfolk and Derbyshire by Bagnall and Harrison (1934) . Galls not distinguishable from those of the smooth form of nervosa; records from Scotland, Wales and the Isle of Man are based on galls only. Taxonomy follows Pujade-Villar et al. (2003) . [hayneanus (Ratzeberg, 1833, Cynips)] Added by Morley (1931) ; specimen in his collection at Ipswich Museum redetermined as umbraculus ( Eady 1952 ). Added by Jennings (2017) ; identified by G. Melika. This species has hitherto been known as S. gallaepomiformis in Britain but it was shown in Pujade-Villar (2005) that this name refers to another species (of Saphonecrus) and the widespread species should be called facialis. Melika (2006a) proposed that gallaepomiformis (Boyer de Fonscolombe, 1832, Diplolepis) should be retained as the valid name but did not make an application to ICZN to overturn the type designation of gallaepomiformis. Added by Chinery & Williams in Melika (2006a) . Some Irish records from O'Connor et al. (2003) . Synonymy follows Fergusson (1986) except where otherwise noted. Western Palaearctic species were revised by Mata-Casanova et al. (2015) . ONYCHIA Haliday in Curtis, 1829 preocc. After the taxonomic changes in the revision by Ros-Farré and Pujade-Villar (2013) it is not entirely certain which nominal species is present in the British material. The authors cite scutellata as British but with a reference to Fergusson (1986) , thus not based on reexamination of specimens. Nomenclature follows Ros-Farré and Pujade-Villar (2009) . Transferred from Figitinae to Aspicerinae by Buffington et al. (2007) . Synonymy follows Fergusson (1986) . dalmanni (Dahlbom, 1842, Figites) nom. nud. Except where noted, nomenclature follows Menke and Evenhuis (1991) and Ferrer-Suay et al. (2012d) . Further taxonomic changes have been made in a series of papers by Ferrer-Suay and colleagues ( Ferrer-Suay et al. 2012a, Ferrer-Suay et al. 2012b, Ferrer-Suay et al. 2012c, Ferrer-Suay et al. 2013a, Ferrer-Suay et al. 2013b, Ferrer-Suay et al. 2013c, Ferrer-Suay et al. 2014a, Ferrer-Suay et al. 2015, Ferrer-Suay et al. 2013d, Ferrer-Suay et al. 2014b ). Tribal subdivisions have been abandoned following Paretas-Martínez et al. (2007) , who found that Alloxystini was paraphyletic with respect to Charipini. Some Welsh occurrence records from Baker (2013) . Quinlan (1978a) listed 36 Alloxysta species for Britain and Ireland, which Fergusson (1986) reduced to 11, mainly through synonymy. However, Fergusson did not work with much reared material and Evenhuis (1985) and Müller et al. (1999) have adopted much narrower species limits than Fergusson, an approach borne out by FVV’s work on the biology and taxonomy of the genus (see Van Veen et al. 2003 ). These species were listed by Quinlan (1978a) but not recognised as British or Irish by Fergusson (1986) and not found by FVV. [ignorata (Kieffer, 1900, Dilyta) nom. dub.] Listed by Fergusson (1986) as a synonym of macrophadnus, the type material of ignorata has not been located and it has not been possible to interpret the name ( Ferrer-Suay et al. 2012b ). Det. Van Veen, added here. The species identified as brachyptera by Müller et al. 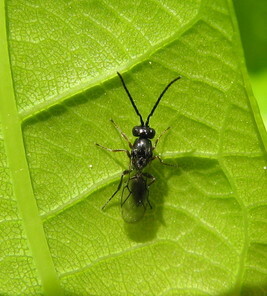 (1999) is actually apteroidea, although the true brachyptera has also been found in Silwood Park. Raised from synonymy with brevis by Ferrer-Suay et al. (2012a) . Raised from synonymy with macrophadnus by Ferrer-Suay et al. (2013) . ruficeps (Cameron, 1883, Allotria) preocc. Synonymised with fulviceps by Fergusson (1986) but treated as a valid species by Ferrer-Suay et al. (2012b) following the advice of FVV. Allotria ruficollis is listed as a synonym of fulviceps in Fauna Europaea ( Noyes et al. 2004 ), following alternate synonymisations under erythrothorax ( Quinlan 1974 ) and castanea ( Evenhuis 1982 ). In Müller et al. (1999) this was recorded as ‘Alloxysta f1’. Synonymised under victrix by Fergusson (1986) but this has not been supported by other workers ( Menke and Evenhuis 1991, Van Veen et al. 2003 ). Synonymised under victrix by Fergusson (1986) but raised from synonymy by Menke and Evenhuis (1991) , a result supported by Van Veen et al. (2003) . castanea (Kieffer, 1904, Pezophycta) preocc. Considered a nomen dubium in Ferrer-Suay et al. (2014) but Evenhuis (1982) studied the type and subsequently identified British specimens as belonging to this taxon, so we see no problem with considering it a valid British species. It was listed as castanea in Quinlan (1978a) but not mentioned by Fergusson (1986) and then recorded again by Müller et al. (1999) . Removed from synonymy with fulviceps by Pujade-Villar et al. (2011) . Synonymised under pedestris by Fergusson (1986) but considered here to be a valid species ( Ferrer-Suay et al. 2012b ). Alloxysta testeacea is recorded as a misidentification of macrophadna by Fergusson (1986) but erroneously listed as a valid species, occurring in Britain, in Fauna Europaea ( Noyes et al. 2004 ), but with the comment that the species might be synonymous with pleuralis. Synonymised under macrophadna by Fergusson (1986) but considered here to be a valid species ( Ferrer-Suay et al. 2012b , following pers. comm. by FVV). det. Van Veen, added here. J. Pujade-Villar (pers. comm.) has seen English material. Excluded from the British and Irish list by Fergusson (1986) but reinstated by Van Veen et al. (2003) . amygdali (Buckton, 1879, Cynips) nom. nud. Fergusson (1986) established Hemicrisis (including only ruficornis) as a synonym of Phaenoglyphis, it was then raised from synonymy by Ronquist (1999) only to be synonymised again with Phaenoglyphis by Pujade-Villar and Paretas-Martínez (2006) . Listed by Quinlan (1978a) as a species of Alloxysta, not mentioned by Fergusson (1986) , then recorded as British by Baker (2013) based on specimens identified by M. Ferrer-Suay. Phaenoglyphis pubicollis (Thomson, 1877, Allotria) was resurrected as a valid species by Pujade-Villar and Paretas-Martínez (2006) . The authors did not examine material from a wide range but state that pubicollis ‘is only represented by type material’, implying that the real ruficornis is the widespread one. Eucoilinae has been a subfamily of Figitidae rather than a family of its own since Ronquist (1999) . Tribal classification follows Forshage and Nordlander (2008) . Synomymy and distribution data taken from Quinlan (1978b) and Nordlander (1978), Nordlander (1980), Nordlander (1981) , Forshage and Nordlander (2008) , supplemented by Fauna Europaea ( Noyes et al. 2004 ) and MF’s identifications of material in BMNH. Some Irish records from O'Connor (2004) . Supposed English specimens in BMNH are all Disorygma curtum (det. MF). Synonymy from Nordlander (1980) . BMNH, det. Forshage, added here. longipes (Cameron, 1883, Erisphagia) preocc. Treated as Episoda xanthoneura by Quinlan (1978b) . 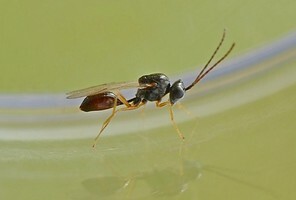 Treated as Ganaspis subnuda by Quinlan (1978b) . Synonymy mostly from Nordlander (1981) . Several new species of Trybliographa are present in Britain and several new synonymies will result from MF’s unpublished revision. Some changes have been made in anticipation of this publication as they affect names described from British specimens. [testaceipes Cameron, 1883] This name will be placed in synonymy. BMNH, det. Forshage, added here. Generic combination not yet formally published. Recently removed from synonymy with trichopsila in Forshage et al. (2013) . giraudi (Kieffer, 1904, Crypteucoela) preocc. Subgeneric classification was finally abandoned and all subgeneric names considered mere synonyms in Forshage and Nordlander (2008) . [myrmecophila Kieffer, 1908] Recorded from Britain in Fauna Europaea ( Noyes et al. 2004 ) but in error. Usually regarded as a species of Trybliographa but published as a new combination in Kleidotoma by Jonsell et al. (1999) in an ecological paper and listed as such in Fauna Europaea ( Noyes et al. 2004 ). The ciliaris sensu auctt. nec Zetterstedt, refers to various small Trybliographa spp. tetratoma Thomson, 1861 preocc. Name preoccupied by Kleidotoma tetratoma (Hartig, 1841, Cothonaspis). Synonymy taken from Nordlander (1978) . [nigriventris Nordlander, 1978] Rhoptromeris nigriventris was listed by Quinlan (1978b) but this was most likely a mistake. Nordlander (1978) mentions that some Swedish paratypes were deposited in BMNH. There are no British or Irish specimens identified as nigriventris in the collection. BMNH, det. Forshage, added here. Only a single male specimen has been found amongst British material; it is not identifiable to species level with our current state of knowledge, and is listed here as a record of the genus from Britain. Melanips has been transferred to Aspicerinae by Buffington et al. (2007) . Removed from synonymy with Sarothrus by Ronquist (1999) . piceus (Dahlbom, 1842, Figites) nom. nud. Included in Quinlan (1978a) but not by Fergusson (1986) .